What's stopping you from playing the piano? Is it the cost of a good quality instrument? Space? How to transport the instrument? We have the solution for the first time player not wanting to make the initial large investment of purchasing an instrument, as well as the perfect size and practicality for the condo and townhome resident. If you’ve dreamed of having a piano in your home but don’t have the space or budget for a full-sized instrument, your wait is over. The affordable FP-30 offers Roland’s acclaimed sound, feel, and modern features in a top-quality 88-note instrument that fits any space with ease. Light and portable. Adding in numerous sounds beyond the piano, built-in practice and recording functions, and Bluetooth® wireless support for working with popular music apps, the FP-30 delivers a premium musical experience previously unattainable in such a streamlined package. Whether you want to make beats, record your band, or compose your own music, GarageBand is a great option to get started! We can show you how to get up and running and what your various options are. Already experimented with some recording, and want to become more advanced? 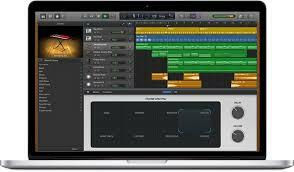 We can train you on the features of Logic Pro X and how you can use them for your specific application. Be trained in one of our recording studios from how to record multiple tracks, using software instruments, recording acoustic guitar, or getting a great vocal sound! $49/session. Contact us to book your session or for more information. Watch videos on our YouTube channel and subscribe! Student performances, Video Pop Star Birthday Parties, Ultimate Glee Camp videos and more! Watch singers drop in for an impromptu performance with your host, Jim Kwan. Subscribe to our You Tube channel to catch all up coming episodes!